Which is the best Jamaican football club team of all time? We suggest a short list of three teams based primarily on their longevity, present activity and achievement. As Jamaica celebrates its Jubilee year we want to highlight the Boys Town, Cavalier and Santos Football Clubs. Unlike Cavalier and Santos, Boys Town was not just a football team. It was founded in 1940 as a multi-purpose institution by a Methodist minister, who eventually penned the words of the Jamaican National Anthem. Observing the plight of the under-privileged youths, Father Hugh Sherlock requested time from the Methodist church to address their needs. Boys’ Town was first located in a churchyard in Jones Town but later removed to Central Road, which was subsequently renamed Collie Smith Drive, in Trench Town on the west Kingston/south St Andrew fringes. Boys’ Town eventually morphed into more than a school. It was as a school that won its first football trophy in 1958 at Sabina Park. Boys’ Town also became a major sports club participating in various Corporate Area and national competitions, especially cricket and football winning the Division 2 in 1965/66 and 67/68 seasons. The boys were also taught home economics (long before girls became a part of the establishment), basketball, and boxing. For many years, Father Sherlock himself represented Boys’ Town at cricket, and the present national technical director of Cayman, Carl Brown, at football. Later dubbed the “Red Brigade,” “Club School,” “Colour Red” or simply BT, Boys’ Town was the first winner of the now defunct D & G Minor League Competition (under 16) in 1965 (also ’69, ’71, and ’75) as well as the Major League in 1973/74. Some of the stars associated with BT were Victor Hunter, Derrick “Shastri” Dennicer, Lloyd “Respic” Morgan, Lenworth Hyde, Milverton Brooks, Herbert “Dago Gordon, Allie McNab and the late Lascelles Shaw and Devon Lewis. Players like David Largie, Edward Dawkins, Les and Carl Brown later represented Santos. BT is the only of the three short listed teams that has returned to the Premier League, after having won the Corporate Area Super League in 2007. The two most famous coaches at BT were Lindy Delapenna and Carl Brown (who was also national coach for a number of years). The former St George’s College Manning Cup Star Andrew Pryce is the present coach. Cavalier collects the 1970 Homilectrix Trophy. 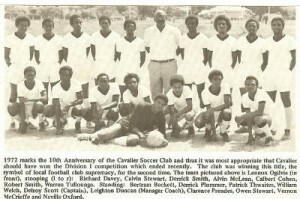 The 2011 -2012 defending Super League Champion is Cavalier, the football club that was started by the late Leighton Duncan in the year of Independence. The achievements of the “Duncan Destroyers” are slightly more modest in comparison to that of Boys’ Town and Santos, having won the Division One competition in 1965 and 1971, and the Homiletrix Knock Out in 1970. Interestingly, when Cavalier copped the Homiletrix Trophy the four top teams from the previous year were featured, including Boys Town, Real Mona and Santos. The player that was voted the most outstanding on that occasion was the wily Cavalier striker Clarence Prendes, who now resides in Canada. His prize was a trip to Mexico City to see the World Cup final between eventual champions Brazil against Italy. Famous names among the “Duncan Destroyers” include Franklyn “Bowla” Morant, Art and Asher Welsh, Colbert “Chickie” Cohen, Delroy Scott, Vester Constantine, Errol Barrett, and Neville Oxford, who all, except “Bowla” , went on to represent Jamaica. After six years Winston replaced himself with, Winthrope “Jackie” Bell. Some of the early players who later became stars include Patrick Chin, Allan Cole, Norman “Guttoo” Thompson, Arthur Williams, Leeford (“Nyah”) and Lenford (“Shyah”) Hardie and Kenneth ‘Bop’ Campbell. “Training in those days was at the Elletson Road Police station grounds (Depot)” and, according to Bop Campbell, their first competition was in division 3. The whole scene had a family atmosphere. “There was an abundance of talent, young talent, which would be the nucleus of Jamaican football in the 70s and 80s… Chungie was the motivating force behind getting funds for us. Those days were fun for fun. We had to be moving from Depot to CAST and whenever there was a problem at Depot we were chased out, so we practically had no grounds on which to train nowhere that we could call our own. Sometimes when we went to CAST, we had to prepare the field ourselves,” said Campbell. In short order other stars like George Burke, Corsel Blair, Orville Edwards, Errol Barrett, Michael Levy, Sammy Lawrence, Esric Brown, Lloyd McLean, Mickey Vernon, Les Brown, Geoffrey Maxwell, Howard Bell, Dennis Zaidie, Dr Carl Grant, Latus McLaren and Edward “Johnnie Cool” Dawkins came on. The club, named after its Brazilian counterpart (Santos, “saints”) won the then Division 2 competition in 1965 and the Division 1 in 1969. Following this Santos had a string of victories in the National Premier League:1973/74, 1974/75, 1975/76, 1976/77 and 1979/80. Santos were the first winners of the Masters League in 1987, a competition they also won in ’88, and ’92. After a dry spell, the club went on to win the Kingston and St Andrew Football Association (KSAFA) Super League in 2002, 2003, and 2004, but failed in its bid to gain promotion to the Premier League. 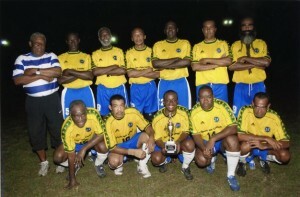 Last year the senior team entered the Kingston and St Andrew Over-45 Golden League Football. They had won the Golden League the week before at the same venue after clipping Packers 2-1 to finish top of the League with twenty eight (28) points. Santos has strong claim to be the greatest of the three teams we have looked at so far, having produced arguably the best Jamaican footballer in the person of Alan “Skill” Cole (the first Jamaican who has played professionally in North and South America), and for winning the national Premier League (under Jackie Bell) and Super League (under Carlton “Spanner” Dennis) on more than one occasion. But notwithstanding all this, the Red Brigade (whose motto is “We Build”) has the slight edge over the club that bears the pugnacious motto: ‘Pugnarae est vincere’ (“To fight is to win”), because their accomplishments in said competitions are quite close and they are the only club of the three participating at the highest level in the twenty-first century.